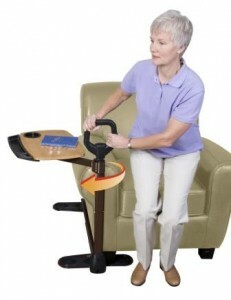 Product Review: Does the Tray Table by Assist-A-Tray “Stand Up” To the Challenge? I had been looking for a new laptop stand since I inherited my husband’s 17” one and my 13” had been passed down to our 8 year old. The 17’ laptop was too big for the cooler-fan I used to hold the smaller one in my lap. I also tried setting the larger laptop just on my lap, but that got to be too hot, and it blocked my view of the TV. Most laptop stands do not work well with a recliner, as there is usually something on the bottom, legs or wheels that cannot slide under it. I saw the Tray Table by Assist-A-Tray and thought I would give it a shot. The difference from other laptops, for me, was that the base actually stays under the chair and the laptop stand itself is what slides in and out. The Tray Table by Assist-A-Tray also comes with a handle to help the user get in and out of their chair, which is a plus for those who have poor balance, vertigo, or like me, joints that subluxate (partially dislocate) for no apparent reason. I have had very few issues with this product since purchasing it. One small problem may be that the base has two support pads, one to go under the front of the chair/sofa and one to go under the back of it. The user can adjust the base stabilizer using the metal pins on either side. However, for someone with hand pain, it is difficult to push them together. I have the base on the shortest setting and the back pads do not have any of my recliner on them to help hold it down. The height of the tray is adjusted using the same metal pin method. Again, painful for anyone with hand issues. My 17” laptop barely fits on it, and the height is either to low, or just a touch to high. The tray table is what swings in and out, so the user needs to make sure that they make space for the tray to be able to move. Overall I give this product 4 Spoons. It lost 1 due to the difficulty of adjusting for someone with bad hands. I have a 17″ macbook, and the way I use it this wouldn’t work for me. I am reclined with my feet up on a leather stool (or laying in bed). But I love my Space Station laptop cooler ( http://www.amazon.com/Evercool-NP-501-Space-Station-Notebook/dp/B001IJVYN4 ). The only problem I had with it was that the bottom is solid, and the edges are sharp on bare skin. Easy solution: duct tape and a hand-towel to cushion it. When I get up, it goes on my footrest or bedside table, and the cooler works amazingly well. Macbooks are notorious for overheating, but not with the dual fan setup. I think that would be something to try. I have been getting up more lately and then I could use my laptop in the living room too. Right now I have my laptop on a laptop tray that I keep on a TV Tray next to my bed. I can pick up the tray and set it on my lap when I can lay on my back. When I can’t lay on my back I can lay on my side and use my laptop on the TV Tray..
I’ve been looking for ages for a suitable lap top table too. I have nerve damage in my coccyx and sacrum, so can’t sit, and need to lay down on a couch (we’re getting recliners soon). I have my laptop on my lap with a cooler fan, but it’s really awkward when I have to get up. Thanks for posting the review of this desk, because it really looks like it could be useful to me. My only problem is whether it is able to be posted to Australia. I’ve been looking at http://www.airdesks.com/index.html – as they also have a great one, but the base is very heavy, so would cost approximately $150 to post to Australia, and I’ll need to have my husband’s family post it for me. It’s great to have another option, and also to have somebody’s review. Dana, I tried several like the ones in the link. You’re right, as long as you didn’t plan on getting up for a while and had somewhere sturdy/safe to set laptop after to keep safe from kids/pets. I also found that the fabric base acted as a conductor for the heat given off by the laptop and my lap would get very hot! The tray assist keeps your laptop up and off your lap. I love mine, but it’s only great when you aren’t planning on getting up very much… something like the Assist-A-Tray looks better for a long-term solution! Thanks Suzanne!